It's been over 20 years since OVOP was first introduced in Oita Prefecture. Today's 300 or so OVOP products include both tangible products (such as local specialties/produce) and intangible products (such as places and events). Oita produces best Shiitake mushrooms in Japan and its production (1,425t in 2001), which accounts for 28% of domestic market share, is by far the highest in Japan. 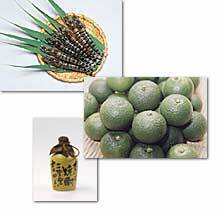 Kabosu limes are only produced in Oita in the whole of Japan, and its annual production in 2001 was 6,050t. Also there are a number of processed products that are made from these limes. 5,630t of greenhouse mandarins are produced every year, taking up 9.2% of domestic market, and ranking Oita 4th in production. Bungo beef, which topped the Japanese Beef Grand Championship in 2002, is known for its quality throughout Japan, while OitaÕs distilled barley spirits, consumed with Kabosu lime juice, is famous for its smooth taste. The success of these products is the result of constant effort to improve quality of production. OVOP has continuously strived to produce value-added products that could bring prosperity to the regions. These include revitalized regions as well as sports and cultural events. Yufuin town and Kuju town have both successfully achieved regional development without compromising natural environment. Naoiri town has promoted carbonated hot-springs and cultural exchanges with foreign countries as its traits. Oyama town set up a unique agricultural production system through its co-op. All of these towns have populations of less than 10,000 and attract much attention for their exceptional success. In the area of sports, there are Oita's soccer team Trinita, which was recently promoted to J1 League, and the annual International Wheelchair Marathon, which has been held in Oita for 22 years, featuring about 400 participants and attracting thousands of spectators every year. Cultural events include Beppu Argerich Music Festival and Oita Asia Sculpture Exhibition. OVOP takes the local and the less celebrated and transforms them into value-added, widely recognized products.